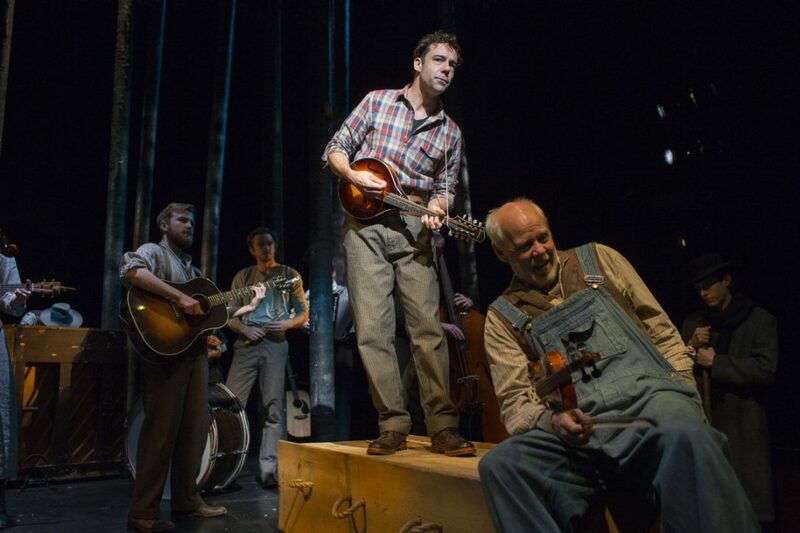 Spoon River, currently running at the Pershing Square Signature Center in NYC, feels like what would happen if Our Town and the best parts of Americana-folk music had a baby. It’s a show about life, cleverly disguised as a show about death from the first moments one walks into the theatre; through the candle-lit corridor, past black-clad mourners offering their condolences. It starts out quiet, and solemn, and dark, ultimately to juxtapose the vibrant, colorful lives explored through a series of vignettes and stirring music made by the cast in front of us. It would be easy to bemoan the show as yet another example of the recent trend to stick instruments in the hands of the cast in the name of artistry while really just trying to cut cost of having an orchestra. And yet, the cast is filled with such earnest musicians, and the show is filled with the unpretentious spirit of ordinary people making music, that it seems the only appropriate way to tell the story. Although I kept waiting for a traditional, coherent narrative that never came, and I expected the vignettes and characters to be more interconnected, the show is best enjoyed on it’s own terms; as a tapestry of separate, diverse lives and stories all connected through a shared cultural heritage of both geography and music. Spoon River is a show that rides the strength of its impressively malleable ensemble of actors/musicians/singers (it would be an injustice to label any of the cast as just one of those things), its spirited musical identity, and its invitation to examine the many lives we live and the many songs we make, and in turn, live a fuller life for that having had that examination.